The Vikings did not only go West to pillage and plunder. Most of the silk found in the Oseberg ship may have been purchased by honest means from Persia. The Norwegian Vikings were more oriented towards the East than we have previously assumed, says Marianne Vedeler, Associate Professor at the Museum of Cultural History, University of Oslo in Norway. After four years of in-depth investigation of the silk trade of the Viking Age, she may change our perceptions of the history of the Norwegian Vikings. The silk trade was far more comprehensive than we have hitherto assumed. The Norwegian Vikings maintained trade connections with Persia and the Byzantine Empire. A network of traders from a variety of places and cultures brought the silk to the Nordic countries. Her details are presented in the book “Silk for the Vikings”, to be published by Oxbow publishers this winter, but in this article you can glimpse some of her key findings. In the Oseberg ship, which was excavated nearly a hundred years ago, more than one hundred small silk fragments were found. This is the oldest find of Viking Age silk in Norway. At the time when the Oseberg silk was discovered, nobody conceived that it could have been imported from Persia. It was generally believed that most of it had been looted from churches and monasteries in England and Ireland. Since the Oseberg excavation, silk from the Viking Age has been found in several locations in the Nordic countries. The last finding was made two years ago at Ness in Hamaroy municipality, Nordland county. Other Norwegian findings of silk from the Viking Age include Gokstad in Vestfold county, Sandanger in the Sunnmore district and Nedre Haugen in Otfold county. The highest number of burial sites containing silk from the Viking Age have been found at Birka in the Uppland region, a few miles west of Stockholm. - Even though Birka has the highest number of burial sites containing silk, there are no other places where so much and such varied silk has been found in a single burial site as in Oseberg, says Marianne Vedeler to the research magazine Apollon. In Oseberg alone, silk from fifteen different textiles, as well as embroideries and tablet-woven silk and wool bands were discovered. Many of the silk pieces had been cut into thin strips and used for articles of clothing. 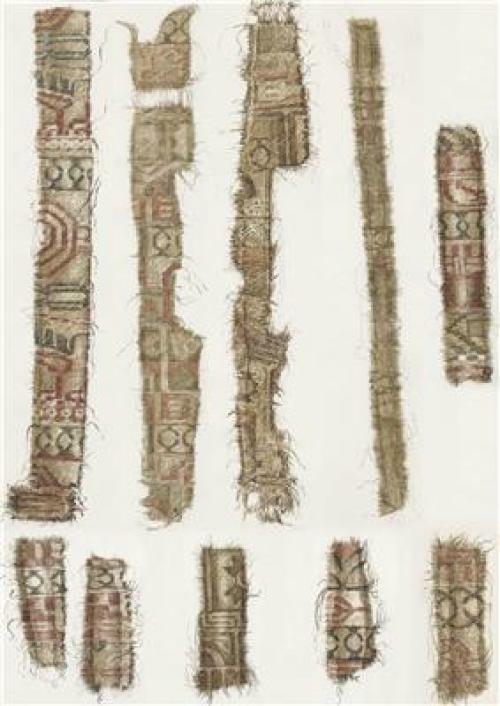 The textiles had been imported, while the tablet-woven bands most likely were made locally from imported silk thread. Marianne Vedeler has collected information on silk and its trade in the Nordic countries. She has also studied manuscripts on silk production and trade along the Russian rivers as well as in Byzantium and Persia. - When seeing it all in its totality, it’s more logical to assume that most of the silk was purchased in the East, rather than being looted from the British Isles. Vedeler believes that in the Viking Age, silk was imported from two main areas. One was Byzantium, meaning in and around Constantinople, or Miklagard, which was the Vikings’ name for present-day Istanbul. The other large core area was Persia. The silk may have been brought northwards along different routes. - One possibility is from the South through Central Europe and onwards to Norway, but I believe that most of the silk came by way of the Russian rivers Dnepr and Volga. - A band of traders joined up in Kiev. Along the river they were attacked by dangerous tribesmen. They needed to pass through rapids and cataracts. Then, slaves had to carry their boat. On the basis of the silk that has been found, there are indications that more silk came to Norway from Persia than from Constantinople. - Large amounts of the Oseberg silk have patterns from the Persian Empire. This silk is woven using a technique called samitum, a sophisticated Oriental weaving method. Many of the silk motifs can be linked to religious motifs from Central Asia. Another pattern depicts a shahrokh, a bird that has a very specific meaning in Persian mythology; it represents a royal blessing. In the Persian myth, the shahrokh bird is the messenger that brings the blessing to a selected prince. In a dream, the bird visits the prince holding a tiara, a tall head adornment, in its beak. The prince then wakes up and knows that he is the chosen one. The image of the imperial bird was popular not only in silk weaving, but also in other art forms in Persia. The motif gained widespread popularity in Persian art. - It’s an amusing paradox that silk textiles with such religious and mythological images were highly prized and used in heathen burial sites in the Nordic countries as well as in European churches. In the Orient, silk was essential for symbolizing power and strength. There was an entire hierarchy of different silk qualities and patterns reserved for civil servants and royalty. Even though silk was a prominent status symbol for the Vikings, they failed to get their hands on the best silk. - Most likely, the bulk of the silk imported to Scandinavia was of medium or below-medium quality. In Byzantium, major restrictions were imposed on the sale of silk to foreign lands. The punishment for illegal sale of silk was draconian. The Persian lands also imposed strict restrictions on the sale and production of silk. In Byzantium, it was illegal to buy more silk than what could be bought for the price of a horse. A foreign trader was allowed to buy silk for ten numismata, while the price of a horse was twelve numismata. - However, several trade agreements that have been preserved show that traders from the North nevertheless had special trade privileges in Byzantium. Silk was not only a trade commodity. Certain types of silk were reserved for diplomatic gifts to foreign countries, as described in Byzantine as well as Persian sources. In Europe, silk became especially popular for wrapping sacred relics in churches. - Some of the silk found in Norway may be gifts or spoils of war, but archaeological as well as written sources indicate that silk was traded in the Nordic countries. - So the Vikings were more honest than has been assumed? - We may safely assume that the Vikings engaged in trade, plunder, exchange of gifts and diplomatic relations in equal measure. A possible example of loot found in the Oseberg ship is a piece of silk with an image of a cross. - This was long before the introduction of Christianity. The silk piece may have been sewn locally, but it is also highly likely that it was purloined from an Irish church. At Gokstad, thin strips of hammered gold wrapped around silk threads were among the findings. - These threads are highly exclusive. We do not know their origin, but we suspect that they may have come from even further east, in the direction of China, says Vedeler, who will now travel to China to find out more. As yet, Vedeler must draw conclusions regarding the origin of the silk by investigating weaving technologies and patterns. With time, she wishes to make use of a new method which is being developed at the University of Copenhagen and which will be able to reveal the geographic origin of artefacts.